Dubbed the man of many talents, meet Virgil Abloh, the man behind streetwear brand, Off-White, creative director for Kanye West, furniture designer, coffee table book author and favored DJ. Yes, you read that correctly. Virgil Abloh is the antithesis of complacency and is inspiring young creatives around the globe. Trained as an architect and an engineer, he left his firm to join Mr. West in 2002, and has since refashioned himself as an all-purpose cultural guru. While Virgil Abloh wear many hats, and yes, being the creative director to Kanye West would be to many the crowning glory of their career, it’s his Milan-based fashion label Off-White, that is earning him respect throughout the industry. Before it all, the Chicago native was a brilliant, super nerdy blogger. Virgil Abloh wrote on the cult blog, THE BRILLIANCE!, which melded simple design with sharp, snarky writing. But, it was his time as a skater kid making graphic tees and selling them to friends that got his fashion career rolling. He had the idea of screen printing Champion sweatshirts to push his ideas and breath new life into the classic staple he wore during his high-school days. He took his work even further and took the leap of faith to create a fashion film that showed what was happening in New York streetwear at the time. He called that line Pyrex Vision, and it was that gamble that catapulted his career and gave him the confidence to create an entire collection, which we know now as Off-White. In just five seasons, Virgil Abloh has taken Off-White from experimental graphic tees to a streamlined collection that hovers in the sweet spot between the street and the runway. Off-White can be explained as a mix of streetwear with high fashion like an Hermès or a Givenchy. Off-White is a hodgepodge of insider references and skate rat staples and borrows from the skate brand Supreme and the Renaissance painter Caravaggio, and takes inspirational queues from Baja style, Mies van der Rohe and even Martha Stewart. “For my brand, I saw an open space and a convergence of high-fashion and streetwear coming, so Off-White was the sprint to stand on third base,” Abloh shares in an interview with GQ Magazine. Off-White’s most recognizable motif is a recurrent pattern of white and black stripes with real-world analogues. Off-White includes shirts and sweats plastered with Caravaggio paintings, beaded camouflage jackets, hand-painted leather jackets and shredded jeans. Virgil Abloh showed Off-White at his first-ever Paris Fashion Week show in September and is selling his collection at retailers such as Selfridges, Paris trendsetter Colette, Antonioli in Milan, I. T. in Hong Kong and on italist.com. “The culture of paradoxes influences me greatly in my creative thought process,” Abloh shares with Hypebeast. 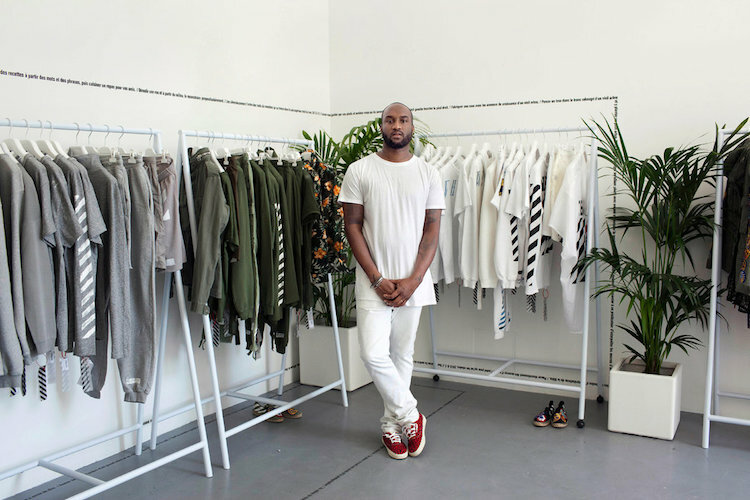 Abloh’s aesthetic pulls immensely from the internet and gives back via the same medium. Unlike the majority of the fashion world, Abloh uses Instagram to show off his design process and behind the scenes moments of Off-White. He figures if he’s going to be one of the first kids to go from making t-shirts to showing at Paris fashion week, he has an obligation to the culture and future young designers to show them the ropes. We are in, he said, “the era of Tommy Ton street style” and “the age of self-styling,” where the look is a high/low mix: “Girls wearing Céline and their boyfriend’s Air Force Ones.” His entire premise with Off-White is to create a brand that’s immersed in this young fashion customer. That young culture is what he’s part of and who he draws from.